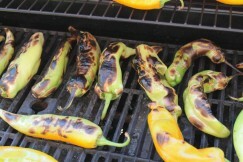 Last night I was roasting some poblano chile peppers on the gas stove because I came across a recipe that I wanted to try, from Jacques Pépin of all people — I did not know he was into Mexican food. That got me musing about a dish that I made years ago when we lived in Cañon City. It was supposed to be a post-Civil War Army recipe from the days of the Indian Wars — real stark, basically beef and red chiles, lots of them. Maybe onions, no beans. And then I went down the Internet rabbit hole looking for it. But the army’s official chili recipe was not published until 1896 in its The Manual for Army Cooks, says John Thorne, chili [sic]  scholar and e-zine publisher at outlawcook.com. Labeled “Chile Con Carne,” the recipe calls for round beefsteak, one tablespoonful of hot dripping, two tablespoonfuls of rice, two large, dry red peppers, one cup of boiling water, a half pint of boiling water and salt, onions and flour. The time hadn’t yet come for garlic and tomatoes to be added to the mix. I don't remember the rice, but years have passed. Speaking of which, I will always think of jackrabbit chile as "poverty food," remembering those years. If you want to make chile con carne for 100, here is a more contemporary Army cooks' recipe (PDF), involving canned tomatoes and beans. New Mexico has its Official State Question, "Red or green? ", but here in the northern fringe of the fictive province (not the state) of New Mexico — south of the Arkansas (Nepeste) River — the question has already been answered for you: "Green." I know I am somewhere near home when I can ask for a side dish of green chile with my meal, and no one bats an eye — even if it is canned stuff off the Sysco truck, which happens. Jacques' recipe is simmering in the big iron pot, meanwhile, and there is some venison sausage that might go in later. 1. Father, forgive them, for Texans can play football, but they know not how to spell. Also, the website has changed at bit. 2. Or to anything written on Texas history.